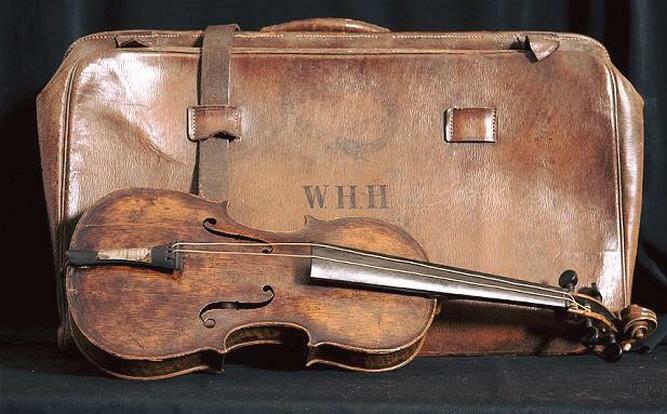 Hartley's body was pulled from the water days after the April 1912 sinking -- he still had his violin case strapped to his back. The final moments of the Titanic produced many stirring tales of bravery and heroism: officers who stayed on deck to load and launch lifeboats until all the boats were safely away, engine room crew who worked away well below decks to keep power and lights running as long as possible, wireless operators who remained at their posts even after the captain released them from duty, and passengers who stood aside so that others might have their seats in the too-few lifeboats. All these people gallantly risked their lives so that others might have a better chance of survival; not because they had to, but because they felt it was their duty. One of most compelling of these tales of self-sacrifice is that of the Titanic's band. They weren't part of the ship's crew (although they nominally signed ship's orders, they were carried as passengers), and they weren't needed to keep the power running or to load the lifeboats; likely no one would have protested if they had sought places in lifeboats. Instead, of their own volition, they stayed with the ship until the very end, steadfastly playing light, airy music to help keep passengers calm while the available lifeboats were loaded.